Create classically lush, liquid textures. This all-analog pedal uses bucket-brigade circuitry to create classically lush, liquid textures that you just cant get with digital circuitry. Rate, Level, and Depth controls, as well as knobs for cutting High and Low frequencies allow ultimate tone control. Like all MXR pedals, the M-234 comes in a heavy-duty housing with durable jacks and switches for a lifetime on the road. As others have said, this thing is amazing. From subtle to experimental, with or without dirt. Full, rich, sounds. Very tweakable. 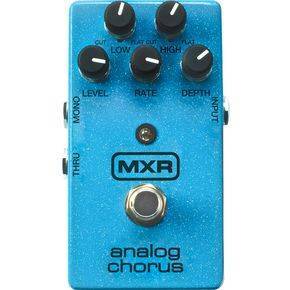 If you're looking for a chorus pedal, you'll be happy with this. If you're looking to thicken up your chords and add some sparkle to your clean picking, this is the pedal for you! You simply cannot recreate digitally IMO, the sound this analogue chorus produces. Playing clean you get a nice sparkle that really accentuates picking? through your chords and lets them ring out. When playing with an overdriven signal it really fattens up your chords and adds some beautiful harmonics to lead playing. Can't say enough about this pedal! I originally ordered the Black Label model but was told it would be months before Dunlop could supply it. After researching it I discovered the M234 is virtually the same pedal without? the cool cosmetic work. If you want chorus i highly recommend the M234! Had my heart set on this pedal for a while... made a trip out to L&M to pick it up (website said it was in stock) and when I got there it wasn't. Was a lil disappointed, but one of the the clerks convinced me into taking home the Boss CE-5 to try out. While it was a nice sounding pedal it lacked character and was a lil too subtle for my taste. Took it back a couple weeks later and exchanged for he MXR once it was in stock... and the CE-5, IMO, isn't in the same league as the MXR. The MXR is so rich and full sounding in comparison. The rate on the MXR is faster than the CE-5 as well and it has more depth, which can be backed off for more subtle modulation. No boost or drop in volume when engaged, the Boss had a slight drop in volume. Build quality is excellent across the board, I'm very happy with it. All you need in a chorus. I get the perfect Rush sound with it when I use it with my OCD. I am really impressed with the MXR pedals! 1 of the best chorus pedals available. If you're looking for a chorus you owe it to yourself to check this out, and I bet you'll take it home, it's that good!! !